Raising sons can be hard in different ways than daughters — especially when the teenage years hit. Teen boys are hardwired to take risks, push boundaries, try new things, and test their surroundings. These habits help them explore their world, discover new things, and prepare for adulthood, but this exploration can be hard for parents watching them, and parenting them, as they go through this time. Parents want and need to form close bonds with their sons so they can help guide them through this challenging and experiential time. Offering guidance and advice is vital to helping sons learn to make the right decisions, and that starts with a clear line of communication between parent and son. But talking to teen boys isn’t always easy, so here are a few tips on how to talk to your teenage son. When talking to your teen son, you may get responses like “yeah, sure, okay, and fine.” Teenage boys tend to be brief in their conversations. Don’t take it personally and don’t let it make you upset or angry. Showing frustration with your teen son’s lack of communication will only push him away and turn short answers into no answers. Also, don’t take his lack of response as an opportunity to fill the conversation with your thoughts. Don’t turn every conversation into a lecture. Understand that this may be your son’s way of communicating for the time being and don’t let short responses stop you from asking questions. If you find it difficult to have conversations with your son, try asking open-ended questions that aren’t as easy for him to ignore or shut down. It may be tempting to ask your son questions about the particular parts of his life you want to know about — school, grades, and work. But kids rarely want to talk about those things. Begin your conversation with questions about things that you know interest them. Maybe you don’t have the same interests as him or care as much about those topics, but it is important to show your support regardless. Then, as the conversation gets going, move on to the details of school and work. Don’t wait until it’s too late. If you have young sons, start opening the lines of communication early on. Your child will be less likely to shut you out if you have been cultivating and growing a healthy relationship from a young age. And talk about the big issues early. Teens will have more resistance to conversations about alcohol and drugs when they are already in high school. Teens begin searching for and craving autonomy. That means they may push you away, spend more time with their friends, and frequently hide in their rooms. So counter their retreat actions by having regular dinners that are expected and planned. When dinner together is a routine activity, it will be hard for your son to avoid. Looking for even more tips to help you communicate with your sons and daughters? 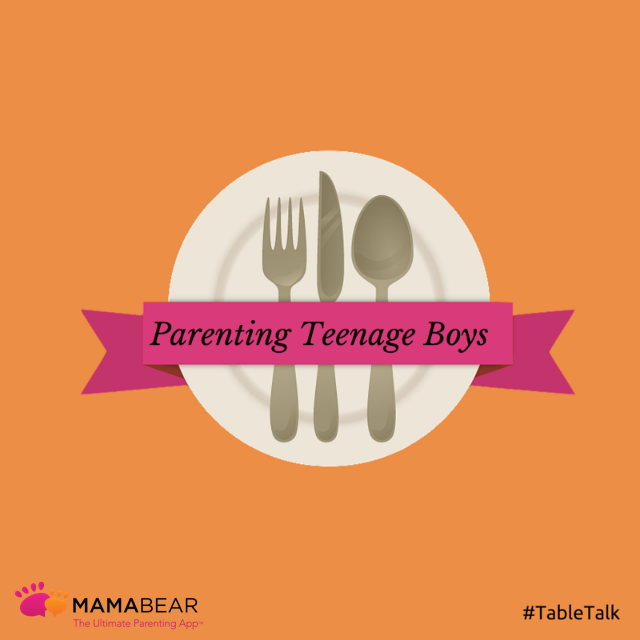 Check out the entire MamaBear series on table topics that can help you have better conversations and bring you closer as you gather around the dinner table.